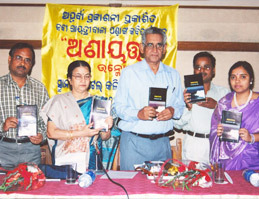 Dr. Gayatribala Panda (b.1977) is a well known Odia poet, fiction writer, editor, journalist and literary critic. Best known for her poetry, she was awarded the first Sahitya Akademi “ Yuva Puraskar” in Odia for her poetry collection “GAAN”(The Village) in 2011. Born on 17th April 1977 in village Sadeipur of District Cuttack (Present District Jagtsinghpur) in Odisha(INDIA) being the first child of Mr. Golak Bihari Panda ans Mrs. Arunima Panda, Gayatri receives her early education in Cuttack, Sadeipur and Balikuda. Then she moved to Cuttack (Shailabala Womens’ College) for college education. She earned her Masters Degree in Library and Information Science from Utkal University, Bhubaneswar, Odisha and went on to Indian Institute of Mass Communication, Dhenkanal for PG Diploma in Journalism and Mass Communication. Then she completed her Masters Degree in Journalism and Mass Communication from Himachal Pradesh University, Shimla. 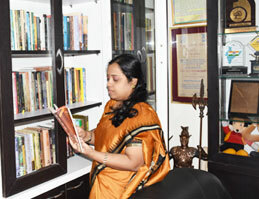 She has been awarded Ph.D in Library and Information Science from Utkal University, Bhubaneswar, Odisha. She was awarded the Gold Medal for securing the highest position in M.A in Library and Information Science from Utkal University and she was also awarded the Gold Medal from Public Relation Society of India(East Region) for securing top position in Advertisement and Public Relation. She lives in Bhubaneswar with her husband Mr. Manas Ranjan Mangaraj and son Maneet Mangaraj. The anguish of a woman, social injustices and inequalities are the most dominant theme of her poetry. Her language is eloquent but simple, making it appealing both to the masses and the intelligentsia. She is an extremely sensitive poet whose keen social concern and vision of realism take on the dimension of a rebellion. Contemporary social reality forms the basis of her poetry. While she represents the cruelty and heartlessness she experiences in society with extraordinary frankness, she also constructs the unexplored territories of feminine consciousness through powerful symbols and images. What makes her a unique voice is her originality in the use of images and poetic diction. Rigorous selection of only the most telling detail from a plethora of themes and issues often form the basic material of her writing. Implicating them through history and myths is her hallmark. Her poems appear simple, but the simplicity achieved the hard way, with painstaking artistry. Her tone is clear and articulation discreet. An unusual fusion of rapture and contemplation, revolt and pity, her poetry is a constant search for the reality and truth of human life beyond its horror, boredom and ugliness. 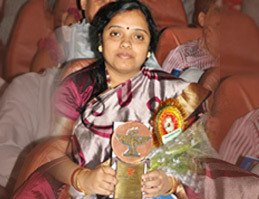 She started Journalism as the career and joined in leading Odia Newspaper ‘Sambad’. After working some years in both field and desk, now she is editing and publishing the widely acclaimed literary quarterly “ANYAA” and also working as a freelance journalist. 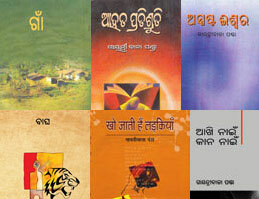 She started writing at an early age of six or seven and got published in all leading odia journals since 2000. She has nine collections of poems, three novels and a collection of short stories published by well-known publication houses of the state. 2015- “National Symposium of Poets” organized by All India Radio, New Delhi. 2015- 'Writers in-residence' programme at the Rashtrapati Bhavan. She has to her credit nine collections of poetry (two of which translated into Hindi), three novels and a collection of short story. 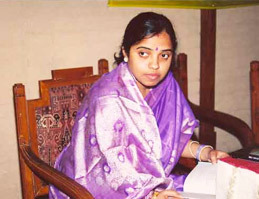 She was awarded first Kendra Sahitya Akademi “ Yuva Puraskar” in Odia for her poetry collection “GAAN”(The Village) in 2011. The anguish of a woman, social injustices and inequalities are the most dominant theme of her poetry. She started Journalism as the career and joined in leading Odia Newspaper ‘Sambad’. 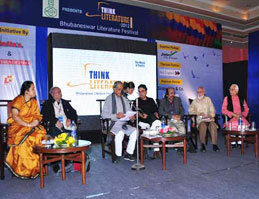 As a poet she has been invited to literary conferences and festivals in various parts of India.